Stretch bracelets make fabulous accessories because they are simple to make and don't require any findings or hardware. As far as the stringing material, there are many types of elastic cording and based on my experience, I prefer two types that stretch well and knot well. I have found others don't hold the knot or do not have very much stretch. One type is the gossamer stretch cord. This is a fiberous, rubbery cording that stretches well and knots well. 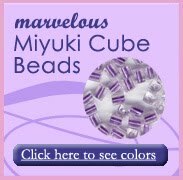 It is thin will work with most types of beads. The recommended type of knot for finishing this cord is a surgeon's knot. I have never used glue on my knots, but you may if you like. The second type is an elastic cord commonly found in sewing shops. This is a rubber elastic that has been wrapped in polyester thread. This type of cord often comes in many colors and thicknesses. Stretch bracelets are also recommended for kids crafts if you don't want to worry about adding a clasp. Elastic cord can be used to create necklaces as well, just make sure the necklaces are long enough to fit over the head without overstretching. If you are concerned about the strength, quality stretch cord will not break too easily, however, it is not unbreakable. Stretch bracelets should not be worn during physical activity or in any situation where the bracelets are likely to get caught or pulled. You can also reinforce stretch bracelets by using two or three strands of cording. 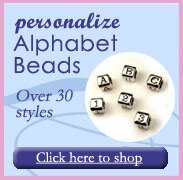 The hole sizes in the beads will have to be large enough to fit the multiple strands, also note that the more strands you use, the less the bracelet will stretch due to the increased resistance of the multiple strands. 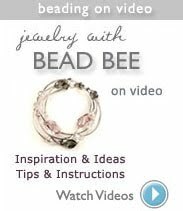 Note: Beaded stretch bracelets should also not be given to young children who may choke on small parts should a bracelet or necklace break apart. 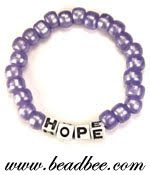 Photo: A simple stretch bracelet design using plastic pony beads and plastic alphabet beads, created for a Relay For Life fundraiser. We would love to help you put together a fun stretch bracelet project for you so please give us a call.